The new medical cannabis industry is moving along in Maryland. The Natalie M. LaPrade Maryland Medical Cannabis Commission has awarded pre-approvals for dispensaries, processors and growers. However, the selection of the processors and growers has been fraught with controversy, and several lawsuits have been filed in response to the way the selections were handled. Nonetheless, hundreds of entrepreneurs have made the decision to enter the medical cannabis business. 1. Medical Cannabis: This technical term is used to describe the ‘green’ plant, commonly referred to as marijuana. Cannabis has medicinal properties and the State of Maryland has passed laws that make it legal for doctors and other medical professionals to prescribe medical cannabis to their patients. The idea of medical cannabis is to allow individuals suffering from certain ailments to use the plant to help with pain management and provide other benefits. 2. Business: Despite the challenges that are sure to come, including, but not limited to, completing the licensing process, facility compliance matters, security issues and staffing concerns, the new ventures make sense to many entrepreneurs. As most businesses are started with the idea of earning a living (making some ‘green’) and charting your own course, this industry is poised to have generational benefits. Additionally, medical cannabis will likely be a billion dollar industry that will contribute significant funds to local and state economies. 3. New Frontier: The ink has barely dried on the laws in Maryland that make it legal to use medical cannabis for health reasons. The newness of the industry can be viewed as being ‘green’ due to the lack of prior industry practices in the State. Many of the businesses that have been awarded pre-approvals for grower, processor and dispensary licenses are newcomers to the industry. These are trailblazers embarking on a new endeavor that is expected to provide many rewarding opportunities. What does this mean for the entrepreneur or business owner who did not apply for one of the medical cannabis licenses? Growers, processors and dispensaries will need lots of products and services: staff trained in the particulars of the industry; security personnel and devices; insurance products; construction of facilities; contractors; banking; and, packaging and labeling. This list is by no means exhaustive; the list is just the beginning of the ancillary products and services needed to operate as a grower, processor or dispensary in Maryland. Put your entrepreneur hat on and think of what your business has to offer the new Maryland industry. 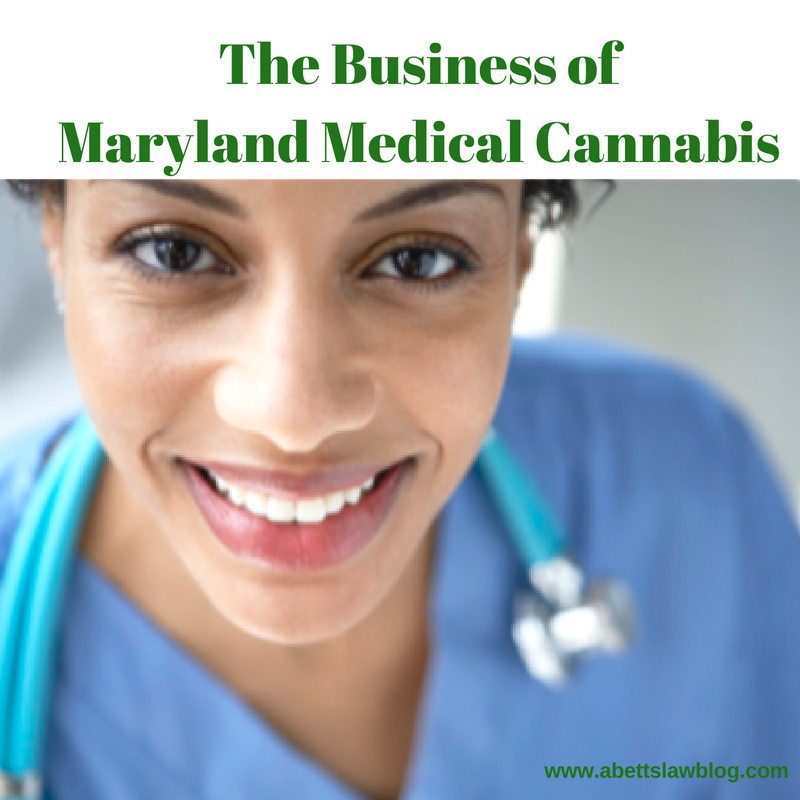 The business of medical cannabis in Maryland is well-suited to be green for many years to come. Aquanetta J. Betts, is an attorney licensed in DC and Maryland. She works with entrepreneurs and businesses, helping them navigate the challenges and opportunities of their industry, including medical cannabis law in Maryland. You can connect with her on twitter @AquanettaBetts. This article is intended for informational purposes only, and not to provide legal advice. Consult with an attorney about your particular situation.